• Plan deploys initial assessments and bases follow-on programming on the assessment results. In this way the plan automatically “scales” to the incoming fitness of the athlete. We’ve studied Pull Ups, Push Ups and the different ways to improve performance multiple times over the past decade of MTI’s existence. 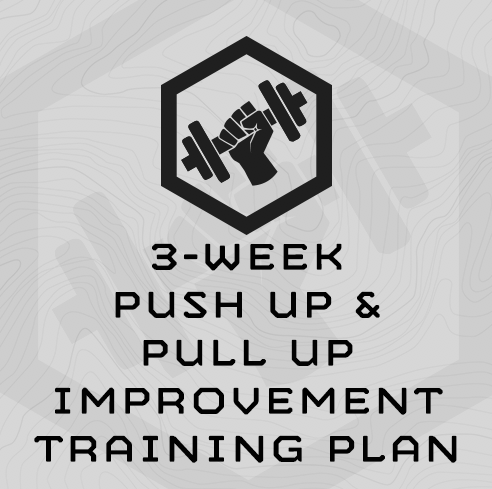 This 3-Week Push Up / Pull Up Improvement Training Plan deploys of our “Density” progression methodology. This is the same programming methodology MTI deploys in our tactical fitness assessment training plans such as the USMC PFT Training Plan and the FBI Special Agent Training Plan. MTI’s Density progressions utilize percentages of the athlete’s max pull up effort on a running clock in order to automatically scale to the athlete’s level of fitness. A single training session only takes 20 minutes and has proven to be an effective method of improving push ups and pull ups for MTI’s Lab Rats in Wyoming and mountain/tactical athletes around the world. You’ll assess max push ups (2 minutes) and pull ups 2 times (beginning and end) during this cycle. You’ll train 4x/week in this 3-week plan. Example: Athlete performs 54x push ups during the 2-minute push up assessment. 30% of 54x pull ups is 16.2 (.3 x 54 = 16.2). Round up to 17. Set your timer to 75 sec. On Round 1, do 17x push ups as fast as possible with proper form, then rest for the remaining time in the 75 sec. interval. When Round 1’s 75 sec. is up, immediately begin Round 2 by sprinting through 17x push ups as fast as possible with proper form, again resting for the remainder of the 75 sec. interval after completing all 17 reps. Repeat this through 6 Rounds. Example: Athlete performs 12x pull ups on the max pull up assessment. 30% of 12x pull ups is 3.6 (.3 x 12 = 3.6). Round up to 4. Set your timer to 75 sec. On Round 1, do 4x pull ups as fast as possible with proper form, then rest for the remaining time in the 75 sec. interval. When Round 1’s 75 sec. is up, immediately begin Round 2 by sprinting through 4x pull ups as fast as possible with proper form, again resting for the remainder of the 75 sec. interval after completing all 4 reps. Repeat this through 6 Rounds. What if I can’t make the prescribed number of push ups for the progressions? It’s ok to break up push up reps during a round. If you hit absolute failure, complete the remaining reps on your knees by doing knee push ups. Don’t quit. What if I can’t make the prescribed number of pull ups for the progressions? It’s ok to break up pull up reps during a round. If you hit absolute failure, complete the remaining reps with eccentric pull ups instead (Jump up, and lower yourself to a slow 5-second count). Don’t quit. How much improvement should I expect to see? This depends primarily on your incoming fitness. Less fit athletes will see a greater improvement. More fit athletes will see less improvement. In our work with the MTI Lab Rats, we’ll see a 5-20% improvement over 3 weeks deploying this progression methodology. Can I repeat this training plan? Yes … but we only recommend repeating it once, back to back. Also – the second time through your gains will be less than the first time. Can I complete these plans in conjunction with other training? Yes – just be smart. Replace any upper body strength work in another program with the progressions in this program. Don’t double up. Parts (3) & (4) - You can break your sets of if needed. As well, you can go to your knees to finish push ups if necessary, and complete eccentric pull ups, if needed. Parts (1) & (2) - You can break your sets of if needed. As well, you can go to your knees to finish push ups if necessary, and complete eccentric pull ups, if needed. "The push up pull up improvement plan is great! Just 20 mins per day and you can greatly improve your upper body strength in such a short time. It's week 1 but am already making progress"